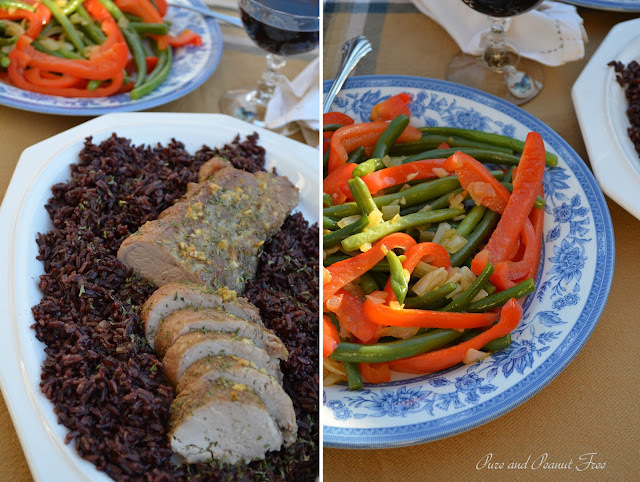 I try to limit the amount of pork my family eats, but there are days when I just need a juicy pork tenderloin roast. Like something my grandmother would have served for Sunday dinner. She always served her roasts on a bed of something; whether it be mashed turnips and potatoes or sautéed spinach and collard greens. And, in an ancient, chipped serving bowl, she'd always offer a colourful medley of fresh vegetables, lightly cooked and still a little crisp, most often picked from the garden hours earlier. She's given me such amazing food memories! So tangible and timeless. I could have eaten her Pepper and Green Bean Sauté yesterday, the memories are so vivid. I can feel her spirit in all the food I cook, and I'm so grateful to be able to give my children these same beautiful memories. My kids had Monday off from school so I decided to create a feast inspired by memories of my grandmother's cooking. Treasured recollections and keepsakes from a time long ago. 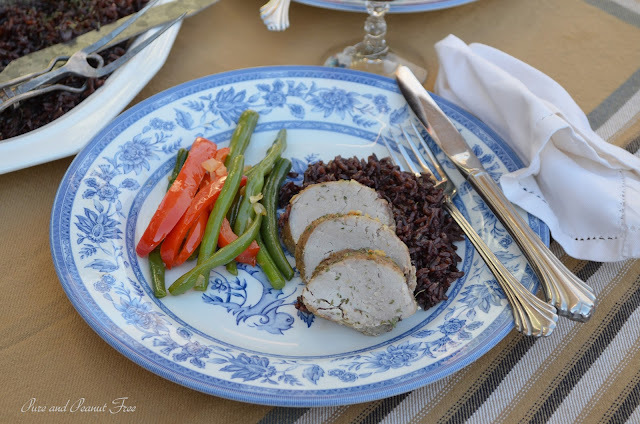 I found a beautiful pork tenderloin, which I coated in a mild, herby rub. I slathered it in in a maple-dijon glaze half way through cooking and, in the style of my grandmother (how often do we say that?! 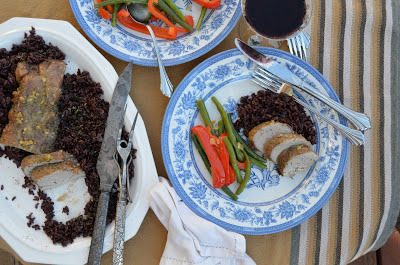 ), I served it on a bed of nutty, regal forbidden rice. The striking, amethyst grains were cooked with just a little onion and chicken stock, and finished with a drizzle of extra virgin olive oil. To accompany it, I made a sauté of the freshest green beans and red bell pepper, cooked until just tender. A variation of the Green Beans Almondine which my grandmother used to make (without the almonds, though you could certainly add them if you're not allergic). It's so satisfying to treat my kids to a feast that could have come straight from their great-grandmother's kitchen. And though they never met her, I feel as if they know her through her food, and through the distinct imprint of her flavours and textures that are embedded within my being. In a mortar and pestle, grind the anise, rosemary, salt, and pepper. Add the chopped garlic and mash until the mixture becomes a coarse paste. 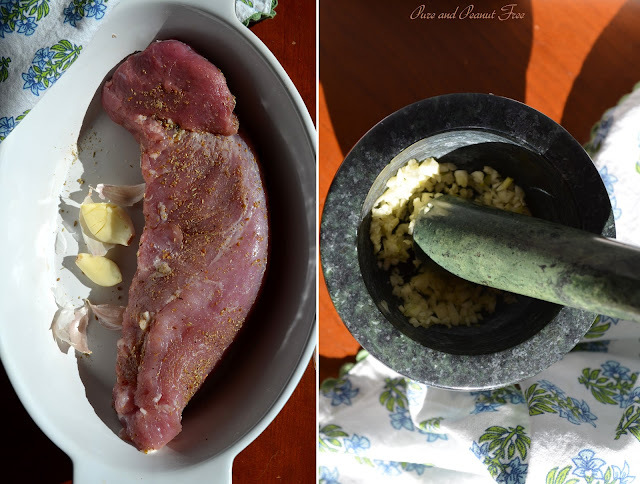 Rub the paste into the pork and refrigerate for at least 4 hours or overnight. Preheat the oven to 350 F (175 C). Line a shallow baking dish with foil and spray with non-stick cooking spray. Place the pork in the pan and roast for 25 minutes. Meanwhile whisk the maple syrup and Dijon mustard together in a small bowl. After 25 minutes, remove the pork and spread the glaze on evenly. Place back in the oven and roast for 15 - 20 minutes longer, until a meat thermometer placed in the centre of the tenderloin reads 160 F (71 C). Cover the meat and allow to rest for 10 minutes before slicing. Slice the meat and serve on a bed of forbidden rice. In a heavy, lidded sauce pan, heat the oil over medium heat. Add the onions and cook until soft. Add the rice and cook, stirring often, until fragrant (3 - 4 minutes). Add the chicken stock and a pinch of salt (depending on how salty your stock is). Bring to a boil. Cover and reduce heat to low. Simmer slowly for 35 - 40 minutes. Remove from heat and drizzle with a little extra virgin olive oil. Spread on a platter and garnish with parsley. Top with the sliced pork. Trim the ends off the green beans, but leave whole. In a steamer basket over simmering water, steam the beans for 10 minutes. 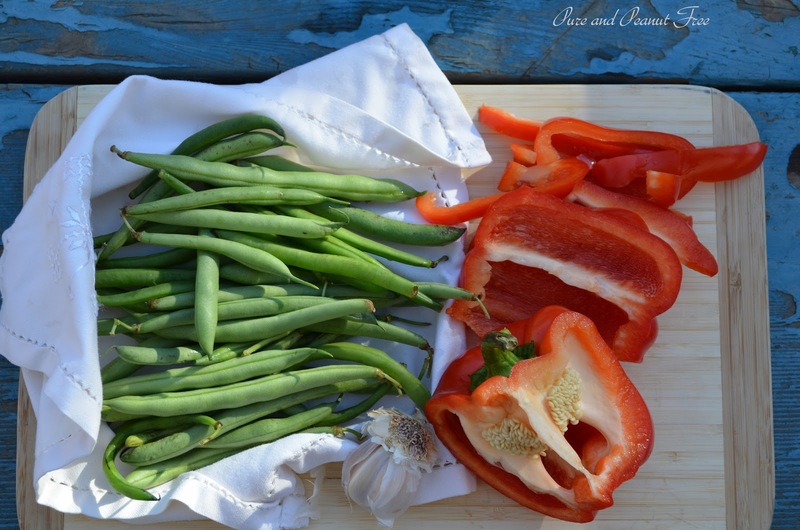 While the beans cook, cut the bell pepper into long strips roughly the same size as the beans. Heat the oil in a large skillet over medium heat. Add the onions and peppers and sauté until the peppers and just barely tender (about 3 minutes). Add the sliced garlic and cook 2 minutes longer. Season with a large pinch of sea salt and black pepper to taste. Add the cooked beans to the pan and toss to coat with the oil and peppers. Cook a minute longer.